The D-brane of dimension 6+1 in type IIA string theory. The lift of the D6 to M-theory is the Kaluza-Klein monopole there (Townsend 95). One way to understand this is as follows: the first Chern class of the M-theory circle bundle is the D0-brane degree-2 RR-field strength R 0R_0. By the self-duality of the RR-fields this is the Hodge dual of the D6-brane degree-8 field strength. 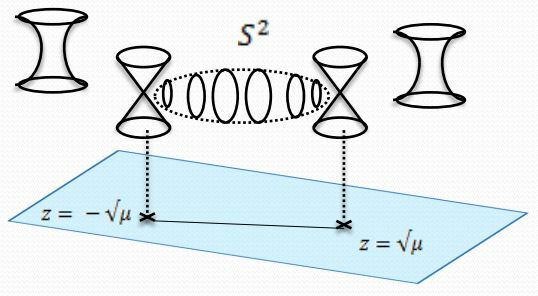 Now given a Kaluza-Klein monopole after removing the locus of the monopole where the circle-fiber degenerates (as in the original Dirac charge quantization argument) it is a non-degenerated circle bundle such that the integral of the 2-form R 0R_0 over any 2-sphere surrounding the singular locus is non-trivial. By the usual yoga of electric-magnetic duality this integral measures the magnetic flux of a D6-brane sitting at the singular locus. For more on this see at Kaluza-Klein monopole – Relation to the D6-brane, and see at M-theory lift of gauge enhancement on D6-branes. The T-dual of the D6 branes is the D7-brane in type IIB string theory. D6-branes are the main ingredient in type IIA string phenomenology in the guise of intersecting D-brane models, see also at string phenomenology the section Models in type II with intersecting branes. Last revised on February 16, 2019 at 13:36:38. See the history of this page for a list of all contributions to it.